The Finns are different. Ask anyone who's spent time around them or visited their country. Or ask a Finn yourself, if you happen to know one. They're part of Scandinavia but they're not true Scandinavians or Nordics; they speak a distinctive language spoken by few people outside their borders save for those whose parents or they themselves emigrate from Finland. That makes for some colorful stories, including tales associated with Christmas. Everybody knows about Santa Claus, or Father Christmas, or Kris Kringle. But how many people know about Joulupukki? Unless you're a Finn, I'll bet you don't. A decidedly Finnish word, Joulupukki means "Christmas Goat" or "Yule Goat" in English. The story behind the name dates from Finnish traditions from a long time ago. Finnish children once grew up hearing scary stories about a goat that every year at Christmastime went around asking people for presents. In its earliest tellings, the Yule Goat only asked for presents; he didn't give them out. In time, the goat morphed into a Santa Claus-like benevolent figure who distributed gifts and good cheer every December riding in a sleigh pulled by his trusted team of reindeer. But be careful to be nice, not naughty, for Joulupukki would leave you with a lump of coal if he knew you'd been bad. All good Finnish people believe that the Yule Goat/Santa Clause lives in the far north of their country in the region known as Lapland, where snow and reindeer abound. They've even built a large tourist theme park called "Christmas Land" near to where they insist the jolly old elf actually lives. No Santa can complete his Christmas Eve duties without a team of reindeer to pull his sleigh, and Finnish Lapland abounds in the antlered wonders, as it does with snow, lots and lots of snow. Finnish fishermen try to get their boats safely back in harbor by no later than the 21st of December in order to spend this most special of holidays with their families. The Finns pay special attention to animals during this time, making sure to hang sheafs of wheat, or bags of nuts, or pieces of suet, or some of all three from the branches of trees for birds to peck at. 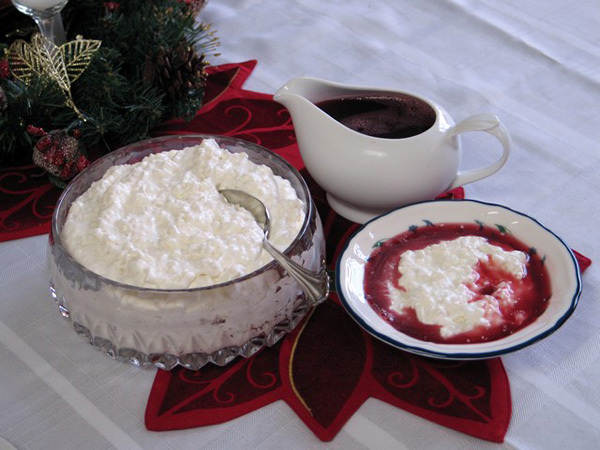 Traditional Yule meals in Finland include a breakfast of rice porridge and plum fruit juice on Christmas morning and a salted fish dish known as Lutefisk as a starter for dinner. Lutefisk is not everyone's cup of tea, and in recent times a meal consisting of a baked leg of pork and mashed potatoes has supplanted it on the holiday menu in most Finnish homes. After much feasting and gift-giving, Finns like to complete their Yuletide celebrations by going ice skating or cross-country skiing. Their thousands of lakes and endless miles of relatively flat terrain, all blanketed with snow, provide the perfect conditions for engaging in those pasttimes. The next time you're in Helsinki or Lapland at Christmas time, and someone says to you in Finnish, “hyvää joulua ja onnellista uutta vuotta”, they're saying to you, "Merry Christmas and Happy New Year."